Across the globe, women are embracing their entrepreneurial spirits and starting creative businesses. In the Company of Women profiles over 100 of these influential and creative women from all ages, races, backgrounds, and industries. Chock full of practical, inspirational advice for those looking to forge their own paths, these interviews detail the keys to success (for example, going with your gut; maintaining meaningful and lasting relationships), highlight the important of everyday rituals (meditating; creating a daily to-do list), and dispense advice for the next generation of women entrepreneurs and makers (stay true to what you believe in; have patience). The book is rounded out with hundreds of lush, original photographs of the women in their work space. "A triumphant compendium of interviews with more than 100 female entrepreneurs, from activists to designers to bakers. . . . The interviews are accompanied by stunning portraits of the women in their homes and work spaces." "One of the Ten Most Un-Put-Downable Reads of the Year"
"Bonney continues to inspire as she offers what she calls 'visibility for powerful women in business.' Whether they're artists, chefs, tattoo artists or writers, creative women of all colors, ages, sexualities and experience share their fears, mistakes and successes." "Bonney's quietly radical, profoundly moving project brings together short interviews with a diverse group of women who share insight on their life's work. . . . Gorgeous photographs reveal a kaleidoscope of joyful enterprise. Small business owners and poets, chefs and cartoonists, potters and musicians all give generous, humorous counsel to taking risks and following one's heart. Their creativity is so inspiring that this book should be in every female's possession, especially young girls in need of positive role models and old girls looking for a kick. Seeing women of so many ethnicities, backgrounds, and abilities successfully living their dreams is totally uplifting." "An invigorating and empowering collection of life-earned wisdom and practical advice." "It's so refreshing to see new faces being featured." 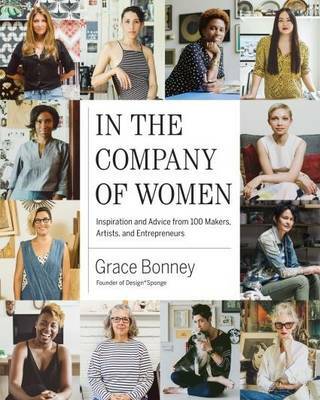 "Learn how to break the glass ceiling from one of the many talented self-starters profiled in Grace Bonney's In the Company of Women. . . . Sage business advice." "In the Company of Women tells the stories of more than 100 women who work for themselves--artists, writers, designers, chefs, musicians. [Author Grace Bonney] talks to established names like Eileen Fisher and Roxane Gay, and women who are just launching their fledgling careers. . . . [A] beautifully diverse range of voices, all of them weighing in on lessons they've learned, mistakes they've made, traits they're proud of, characteristics they admire in others and so on." "This inspiring book encapsulates the stories of more than 100 creative women in the areas of design, visual arts, culinary arts, literature, and show business in short Q&As about the lessons they've learned on their journeys to success." "An excellent source of inspiration for women (and men) of all ages." "[This book] acts as a source of inspiration for anyone, regardless of gender, who's running a business, or thinking about it." "Give the gift of empowerment with this inspiring compilation of interviews. . . . Wrap this up for a recent grad, creative mind, or anyone looking for a healthy dose of girl power." "Grace's excellent book is full of empowering business advice from a diverse group of inspirational and talented women." "Grace Bonney has given us our favorite icons, heroes, and bandit queens in one of the oldest living forms of communication: a book. Enjoy, dear readers, for each page turn is a meditation on the power of the Divine Feminine." "These amazing stories will surely spark something deep within us all: the courage to dream and the fortitude to make those dreams happen." "A joyful book that celebrates both the diversity of beauty and the beauty of diversity: in race, age, size, sexuality, and ways of thinking." "I want to rip out every page of this glorious book and hang them on my wall so that I can be surrounded by these incredible women all day long." "I hope this book becomes an almanac that will continue to expound on the work and the lives of everyday cis, trans, and queer women and women of color who are building and becoming businesses, and that will remind other exceptional women that they are in good company."